When I asked Lily what kind of birthday party she wanted to have, she was all over the place like a four year old should be. Here's a sampling of what she would say exclaim when I would ask her what she'd like to do: Princess! Fairies! Whales! Radishes! (dead serious, you guys) Dance! Nail Polish! Fancy Nancy! Phew. I tried to prod her in certain directions, but we weren't getting anywhere. Then it hit me one night as I was laying in bed bouncing ideas around my brain. 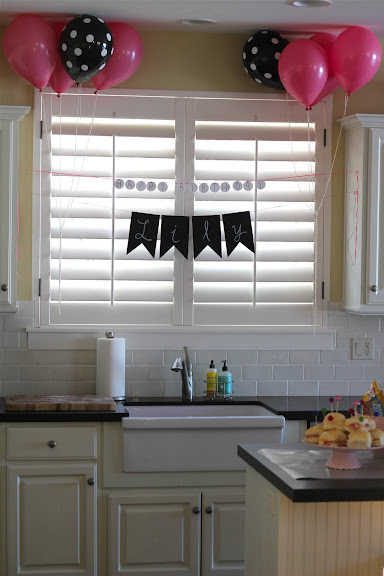 Why not throw a girly-girl party?! Bingo. A girly-girl party would surley fit most of Lily's desires under its umbrella.....all except maybe the whales. I pitched the idea to Lily and she loved it, so we ran with it! The party came together with ease and Lily and I had fun making it all happen. On a completely unrelated note (but somewhat related), I've decided that we're going to throw a friend party for our kids every other year, starting when they turn four. I know lots of other families do this and I think it's so smart. Gives us moms a nice break to let the creative juices fill back up and your bank account gets a break too! 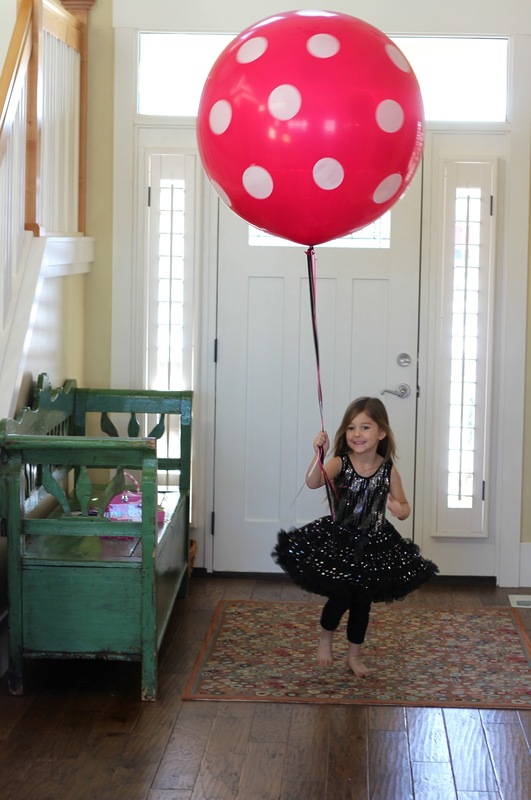 Here are some pictures from Lily's first official friend party, if you'd like to take a look. 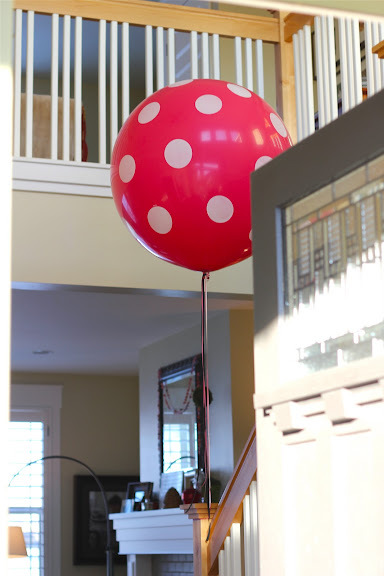 This giant balloon (36 in diameter) greeted the guests when they arrived. 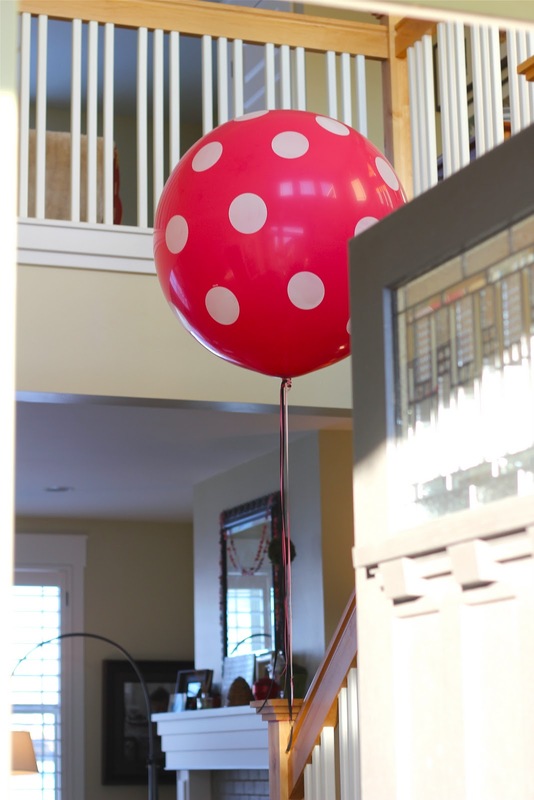 Lily and I fell hard for this balloon when we walked in the party supply store. We had to have it! I dug through my craft supplies to make these banners and they came together in about an hour. Lily helped me punch out the circles with our round punch for the happy birthday banner. I used a black sharpie to do the all caps lettering and then I strung it up with some pink ribbon. For the Lily banner I used black cardstock that I cut into the flag like shape, strung them on some hemp twine, then I used a piece of white chalk to do the girly cursive lettering. The Lily banner ended up being one of my favorite elements of the party. Black, when used right can have a cool impact. We flanked the banners with some balloons from Zurchers (party supply store in Orem, UT if you're local). Nice and simple. Randy grabbed a mediocre grocery store bouquet of flowers the morning of the party and it totally pulled the food table together. Flowers are the icing on the cake, so to speak....even if they are mediocre. For the food I made some simple ham and cheese roll sandwiches (with a fancy toothpick, our subtle nod to the Fancy Nancy books), raspberry lemonade, and some kid friendly fruit and veg. White cupcakes w/ strawberry buttercream frosting per Lily's request. I piped that icing on the cupcakes half-hazardly and that is just the way I like it. It took me all of 10 minutes. I pulled out all my pink bowls and cake stands for the table. I rolled out a piece of black and white wrapping paper for a little interest and a foundation. Want to hear something weird? Pink is my least favorite color, but I LOVE and am always drawn to it on dishes and serving pieces. The girls ate their food on a blanket picnic style. They all LOVED this. Scouts honor, not one of those glasses of raspberry lemonade got tipped over. I adore this picture of Lily. So happy. So excited. The girls painted wooden jewelry box purses that you can find at Michael's. You don't see it, but I made each of the little girls wear a white garbage sack to protect their clothes. We let the boxes dry while we opened presents. After presents we came back and "bedazzled" (this was a stretch for me) the boxes with some sticky gems and some glitter. In true Lily fashion, she chose sunglasses and lip gloss for the party favors. We got the lip gloss in a pack at Michael's and the sunglasses in a pack at Zurcher's. Both the lip gloss and the sunglass pack were super inexpensive. I think the lip gloss pack was around four dollars and the pack of 12 sunglasses was around 10 bucks. The striped bag is from Zurcher's as well. We sealed the bag with some pink washi tape from my own stash. Thanks for letting me share this really long post about Lily's fourth birthday. It was a pleasure to put together and Lily had so much fun, which makes me the happiest mom in the world. However, I did learn a few things that I will do for parties to come, like being aware of where the products I'm buying are made. This is a hard feat since it seems as though everything is made in China. Next time I'll put more effort in to finding favors and supplies that are made in the states or local. I also loved having a helper at the party and I will definitely do this again. It was especially helpful when we painted the girls nails! Thanks to my girl, Abby, for helping me out the day of the party and making it that much more fun. If you have any questions about the party, leave a comment and I'll respond in the comments. Thanks for stopping by today! Love it all Bri! Excellent job Sister!!!!! Thanks, Kjirst'! Love you too! So SO CUTE! Looks amazing and fun! What a cute girl. Great decor and games. Cute food and her dress is stinkin' cute! every other year is such a great idea! I get kind of giddy when you do a party - it's such a treat for me. Man I'm lame. :) You just always do such a good job, and it's fun to see your little details. I'm so crazy about stripey paper straws right now. I bought 7 packs of 144, so I don't think I'll be running out any time soon. I love all of your pink dishes! And that last picture of Lily is the best picture EVER. Dang she's cute. Thanks you, Audrey! You are the sweetest. Aaw, thanks Haley. You are the coolest. I'm crazy about stripey paper straws right now too! Oh geez! Addie's freaking out just looking at the pictures! Nice work, looks perfect for cute little girly girls! You are amazing! My twins are turning one next month I wish I could pull something like this off! So SO cute!! PS I am pinning this? Is that okay?? Jaime- Of course it's okay!